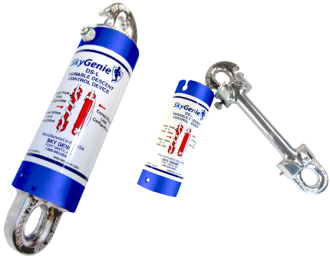 Manufactured of high strength, light weight aluminum, the Sky Genie allows a preset rate of descent by number of turns around the shaft. Few turns for rapid descent, more for slower rates. Descent speed must be controlled by user. Decelerate or stop descent & remain suspended by applying pressure to free end of line. Remain in one position by looping free end of line over the top of the Sky Genie. Unit can be controlled at, above or below point of descent. Line(s) must be anchored to a point capable of supporting a minimum dead weight of 5,000 pounds.